It was with a bit of a heavy heart that we awoke, as we knew it was our last day of our vacation in Québec. We had a fairly modest day planned and spent the morning packing our bags, doing laundry and tidying up the apartment. I’d made reservations for a noon brunch at Le Clocher Penché, which was reputed to be one of the best places to get brunch in town. 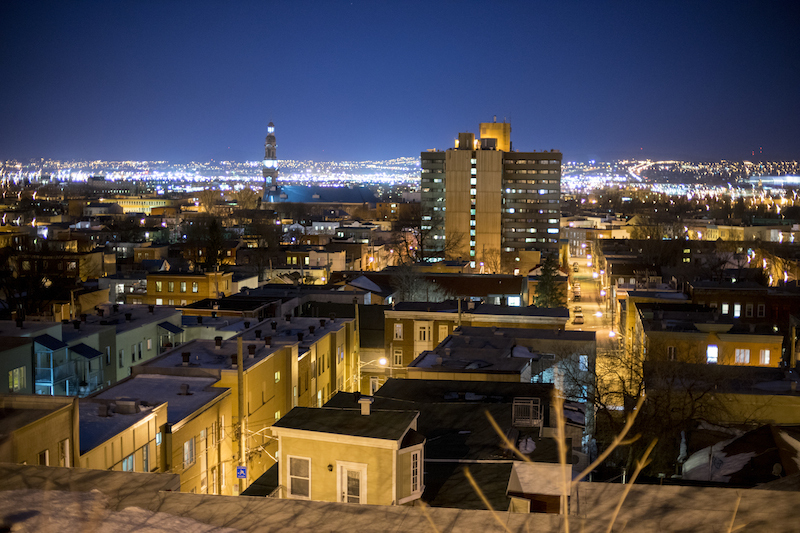 It was located down in the Saint-Roch area of town, formerly a working-class industrial district that had recently been refurbished and spruced up with shops and fun new restaurants. It wasn’t far from our apartment, so we made the walk down–and I do mean down. The area of town is located a fair bit lower than the part of Quebec we’d been staying in, so we made the rather precipitous walk down the hill (there is also apparently an elevator that you can take down). We turned onto Rue St. Joseph, the main drag of the Saint-Roch area, passing a number of restaurants (including the one we’d later be eating at) and cafés. Le Clocher Penché, perhaps unsurprisingly, was kitty-corner to a large church. The restaurant was packed full of brunching folk, so I was glad I’d made a reservation. David admired the decor, particularly the wood paneling on the walls, and we both loved its open, congenial feel. As it was our last day, we celebrated our vacation success by ordering a bottle of bubbles to get the day started right. The brunch menu was thematically named, with various religiously named dishes. 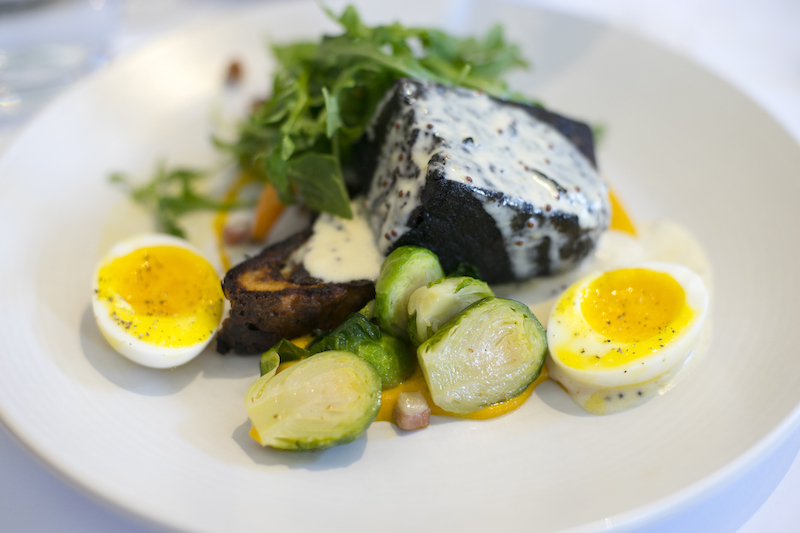 We ordered Le Sang des Saints (“Blood of the Saints”) and La Bénédiction (“The Benediction”), homemade blood pudding with French toast and mustard sauce and eggs benedict with salmon gravlax and hollandaise sauce, respectively. They started us off with a little yogurt and jellied honey with a granola crumble, which was super tasty. Jellied honey was definitely something I hadn’t tried before. Our dishes soon arrived, and we dug in right quick, as they looked delicious. Their looks did not disappoint–they were superbly done. David thoroughly enjoyed his hefty portion of blood pudding, and I, always a sucker for a good hollandaise sauce, was in heaven with my eggs benedict. The salmon gravlax was also excellent. We were very happy (and full) campers and lingered over our bottle of wine. We chatted with our friendly waitress for a bit about our trip before heading out. It hadn’t unfortunately warmed up appreciably from the day before, so the wind was brisk. We walked off our brunch by taking a leisurely stroll down Rue St. Joseph. 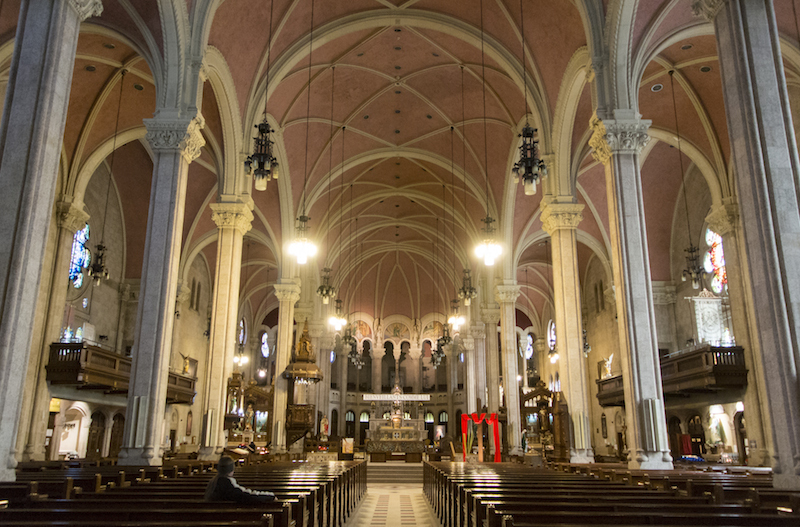 On our way, we came across an imposing church (Église Saint-Roch) with soaring, pink ceilings. We warmed up in the calming silence of the church, before heading back out into the bustle of Rue St. Joseph. 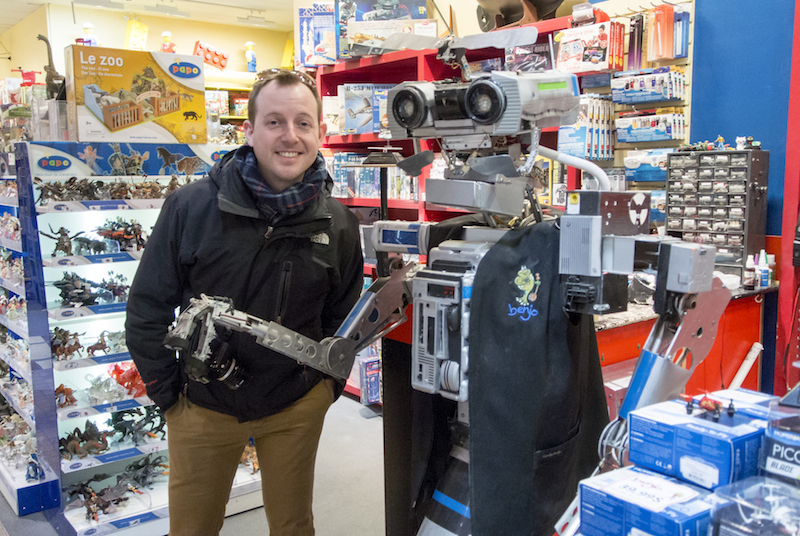 Not far down the street, we popped into Benjo, a renowned toy store, for a bit of warmth and to peruse the fun goodies. David was definitely in his element, gleefully examining the remote-controlled cars and lego sets. Once we’d sufficiently satisfied on our inner child, we decided to work on satisfying our outer adult by going to find a drink. I’d heard about a little brewery at the other end of Saint-Roch area called La Barberie, so we thought we’d try to find it. After much wandering, we didn’t come across it, so David asked for directions in a nearby convenience store, which he (somewhat) understood (apparently the Quebecois accent is a bit challenging to understand). We followed their directions and eventually found it, naturally just around the corner from where we’d stopped looking. It was a cozy, little place, where folks played Scrabble or chess and occasionally took their shoes off to relax. Unfortunately for me, being a brewery, they did not offer wine, so I nursed a lemonade while David sampled their stout. It’s seems these days to be an inevitability at the end of a trip, no matter the length apparently, that I start feeling the fatigue of being on the road and always on the go. I was definitely starting to fade at this point, so I suggested catching a bus back to the apartment to rest for a couple of hours before dinner. Thankfully, we were just around the corner from where we caught our first bus in Québec, so it wasn’t long before we were on the (rather slow-going) bus back home. I finished packing our bags and enjoyed a little pre-dinner snack, needing to get through some of the food that we’d bought, before heading back down the steep hill to our dinner spot for the evening: L’Affaire est Ketchup. 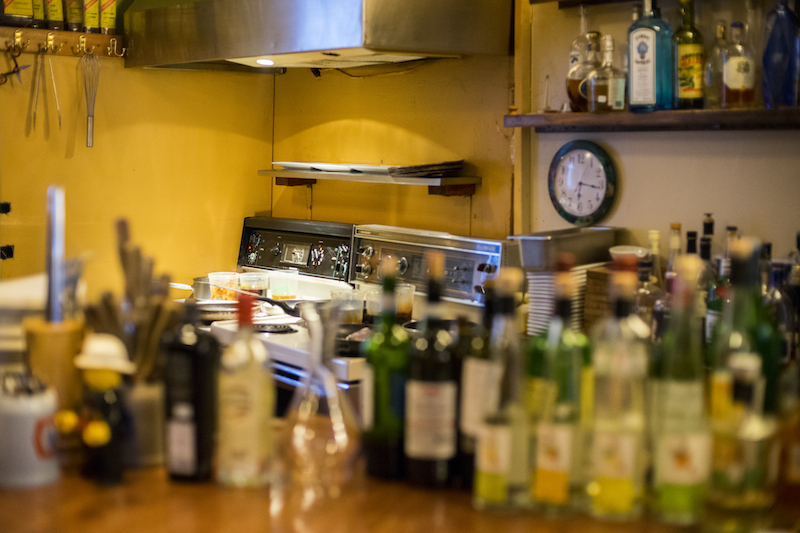 It would be easy to miss the relatively nondescript storefront of L’Affaire est Ketchup. We’d heard about the place on Anthony Bourdain’s show Parts Unknown, in part famous for their very laid-back, DIY style, including their use of old school electric stovetops (the kind my mother use to have). Indeed, the interior felt very much like a converted apartment and that we were just hanging out in someone’s cozy kitchen. We had an early reservation so we were the first ones to arrive. The only menu was written on a chalkboard, so we perused our choices and found ourselves torn (semi-seriously contemplating just trying everything). It was just two guys working, the chef and a bartender/waiter/host/dishwasher, who congenially explained the entire menu to us in English. We decided to start with veal sweetbreads (’cause we can’t resist) and a wild mushroom appetizer. We learned later that the sweetbreads was the dish upon which the restaurant’s reputation was built. We certainly could see why. 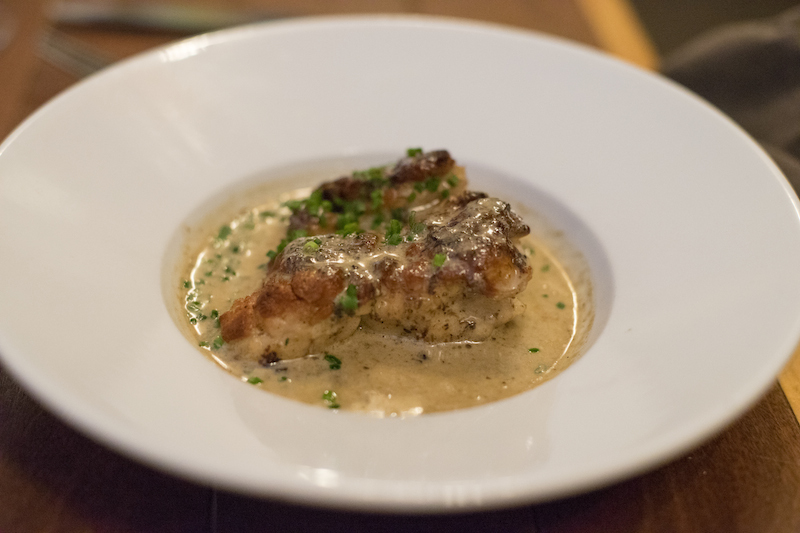 Perfectly seared sweetbreads in a truffle cream sauce, it was devastatingly delicious. The mushrooms with bacon were also earthy and tasty–so simple, but a solid dish. For our mains, David boldly ordered kid (or “goatling” in our waiter’s parlance) belly on mashed potatoes with goat cheese. I couldn’t pass up once last duck dish, which was on a yam puree. David loved his kid–great pull-apart tenderness, it was rich but less pungent than adult goat, but still with a wild character to it. 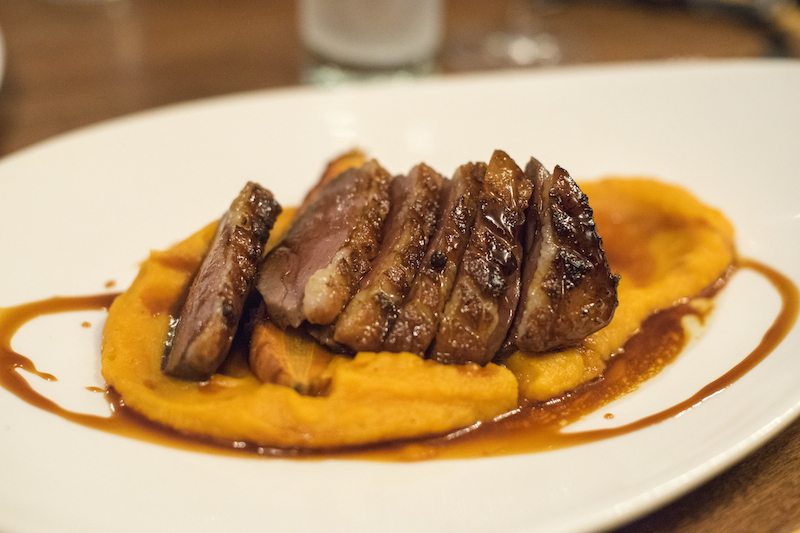 I loved the combination of the sweetness of the yam puree with the savouriness of the duck breast. All around yum. We sat for awhile contentedly sipping our drinks–David his fine gins (one happened to be from Vancouver Island, actually) and me enjoying sparkling wine. We were amazed at the quality of food, despite the seemingly humble setup. As we were interested in taking a peek into the goings-on of the kitchen, we asked to take our dessert, a super rich, tasty chocolate brownie, at the tiny bar that overlooked the quaint, open kitchen. The chef and our bartender/host for the evening were super friendly, chatting us up and offering samples of red wine to try. It was a perfect end to a trip so dominated by gastronomical adventures, a relaxing night hanging out with congenial folk who truly appreciate good food and drink. The style of the place and the people made David nostalgic for Portland, that same kind of DIY feel, in very unassuming surroundings. I was stuffed to the brim, so we said our goodbyes and made the long, arduous trek back up the hill (made all the more difficult by our full belies), sated and satisfied. Québec, you have done us well. Merci bien. So glad you were pleased with every aspect of your séjour à Québec. You two if anyone would have a fine appreciation of all its subtleties.